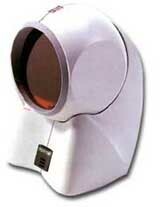 No Point of Sale would be complete without the hardware to make it function correctly. A development team designing and implementing a POS application for a retailer faces a myriad number of decisions. (POS may be Point-of-Sale or Point-of-Service, depending upon a company's marketing team.) One of the more vexing issues is the selection of and programming to the physical POS devices, including a POS printer, a bar-code scanner, and a credit/debit card reader. Why has this been difficult? Because of the significant disparity in features, functionality, and programmatic interfaces from vendor to vendor, and sometimes even within devices from a vendor. Therefore, the application team has historically chosen and implemented interface logic for some mandatory set of devices for initial deployment, then added to this set as time allows or additional customers require. The first widely-adopted POS device standard is OPOS. OPOS was initiated by Microsoft, NCR, Epson, and Fujitsu-ICL to help integrate POS hardware into applications for the Windows™ family of operating systems. OPOS uses COM technology, and is therefore language independent. The acronym stands for "OLE for POS", which is somewhat dated due to the renaming of "OLE" to "ActiveX" and "COM". But OPOS has been retained for historical and recognition reasons. The first OPOS technical meeting was convened in January, 1995. The first production release, 1.01, was made in March, 1996. Its seventh release, 1.6, was in July, 2001. 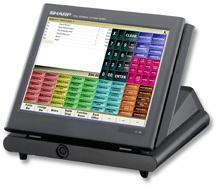 JavaPOS was initiated by Sun, IBM, and NCR to help integrate POS hardware into applications for the Java language. JavaPOS is operating system independent. The first JavaPOS technical meeting was convened in April, 1997. The first release, 1.4, was made in March, 1999, and it tracks closely with OPOS 1.4 (released in October, 1998). The 1.6 release was in July, 2001. 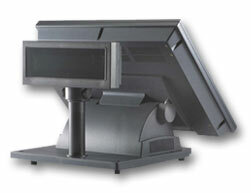 UnifiedPOS was initiated by a consortium of retailers, and is led by the National Retail Federation. Beginning with release 1.5, both OPOS and JavaPOS have approved UnifiedPOS as the owner of language and operating system independent POS device interfaces. OPOS then maps these interfaces for COM within Windows, and JavaPOS maps them for Java. Beginning with release 1.7, the OPOS and JavaPOS committees no longer release an implementation-specific document. 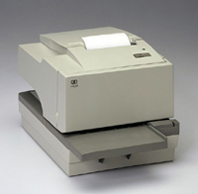 The UnifiedPOS document has added implementation information into appendices. Most customers want a Receipt (invoice) when they purchase items through your Point of Sale system. 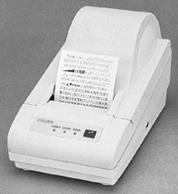 Receipt printers can be thermal or impact in nature. Most are 40 columns wide and feed out just the amount of paper needed to make the receipt. Cash drawers can be hooked into most receipt printers. Cash Drawers are used to hold the money the customer gives you and the change you give back to the customer. 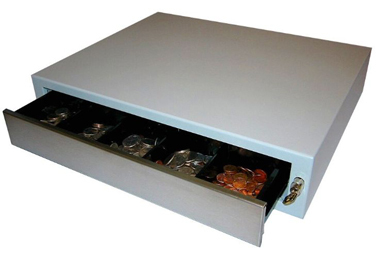 A Cash drawer should pop open automatically when a sale is tendered. A Good Point of Sale will record every time a cash drawer is popped open. Cash drawers have a plastic drawer inset that is easy to remove for loading and counting of the monies at the end of the day. 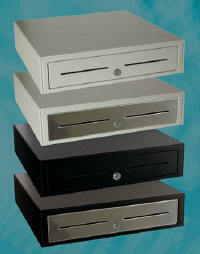 Cash drawers can be installed over or under the counters. 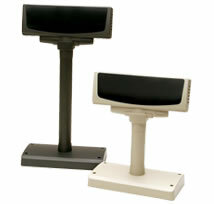 Pole Display are used to show the customer what is being rung up at the POS terminal. The trend these days is to go with a second display screen pointing to the customer. This can show the receipt as things are rung up as well as show ads for up-selling. 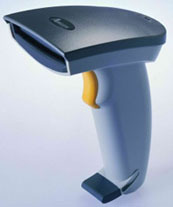 Barcode scanners are used by a Point of Sale system to quickly enter into the system an item for sale. 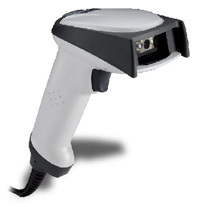 There are several models from cheap CCD models to very fancy ones that can read a barcode from longer distances as well from any orientation. 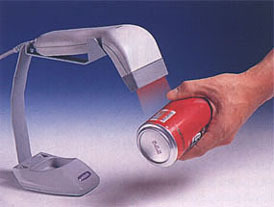 Some scanners are wireless. 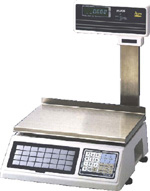 Scales should directly interface to the Point of Sale system. 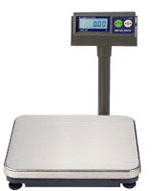 Items sold by weight are placed on the scale and the selling price is calculated. 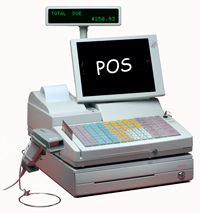 As you can see, there is many, many choices for equipment in the POS industry. How do you know what to select or what you need? This is where your local POS dealer comes in. Shown above is just a small sample of the hundreds of companies manufacturing and selling POS hardware. Contact your local POS dealer for help.